Mark Ellis needed a job. And he needed something with flexible hours. That’s because Ellis is a pastor. He could be called at any time. And his obligation is to respond … at any time. Ellis pastors in Piqua. Mornings are typically the only part of the day that’s unspoken for. BarryStaff knew this, and called him as soon as a part-time position with Quality Forms in Piqua opened up. It’s near his church — and only 5 minutes from his house. “People are willing to work with me here,” he said. Quality forms began in 1884 as the Little Printing Company in Bradford. Now it occupies a 56,000-square-foot facility. They print mainly business forms — like pamphlets and business checks. The company prints for more than 1,200 different distributorships in the United States. Ellis is a jack of all trades. Arriving early in the morning, the self-described handyman tackles whatever needs to be done before the day begins in full swing. The trickiest part is mastering the jargon, but it’s coming along. Ellis has never worked in this type of environment before. Everyone is pitching in to help Ellis learn the trade. 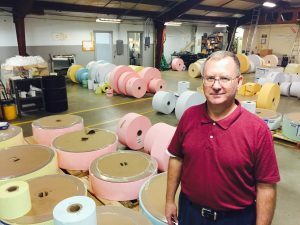 Quality Forms has about 20 employees, many of whom have 20 years of experience with the company. “They’ve been so friendly,” Ellis said. The company is fully aware of his pastoral obligations and they’ve ensured him plenty of leeway. Ellis is thankful to be so close to home and to so many of the people that could call on him at any moment. “The only thing I asked (of BarryStaff) is to find me something with the amount of hours I wanted and flexibility.” he said. “I’ve got both here.